It's well known that water is sparingly soluble in oil, but the mechanism and thermodynamics of water dissolving into oil are open questions. Our recent computer simulations provide insight into this fundamental transport event. 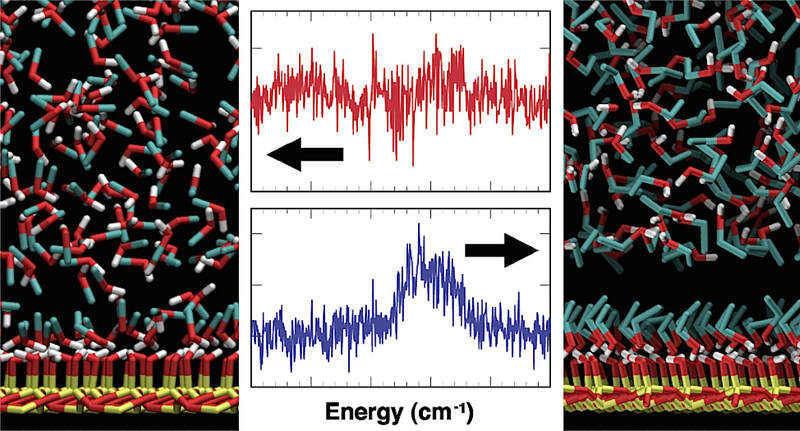 The hydroxylated surface of silica induces order in an adjacent polar liquid. 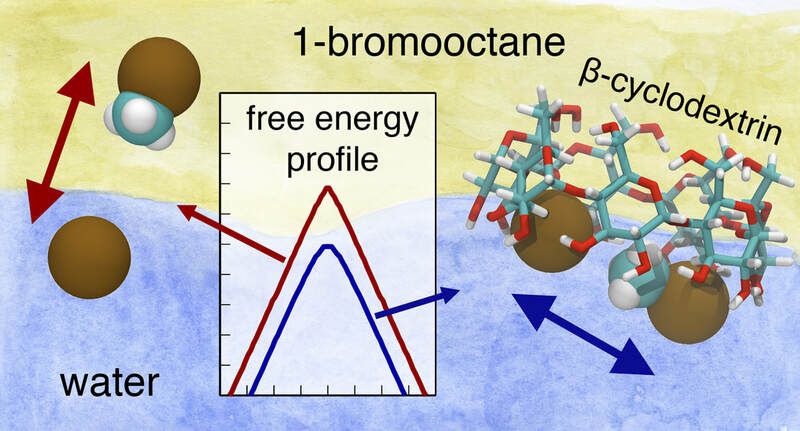 In a collaboration with experimental nonlinear spectroscopists we were able to model the methanol/silica and ethanol/silica interfaces and quantify the differences in the liquids' interfacial structure. Why is chloroform such a great solvent? 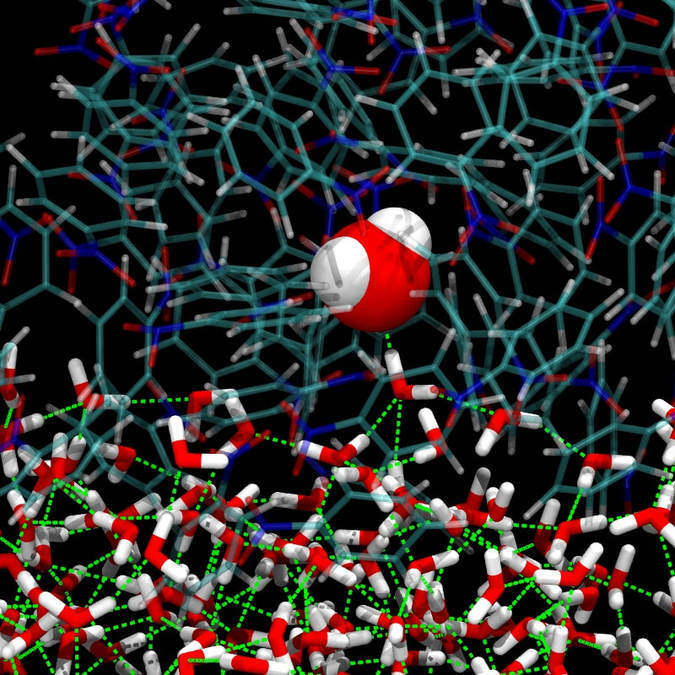 We used molecular dynamics simulations and new geometrical analyses to understand recent neutron diffraction experimental results. 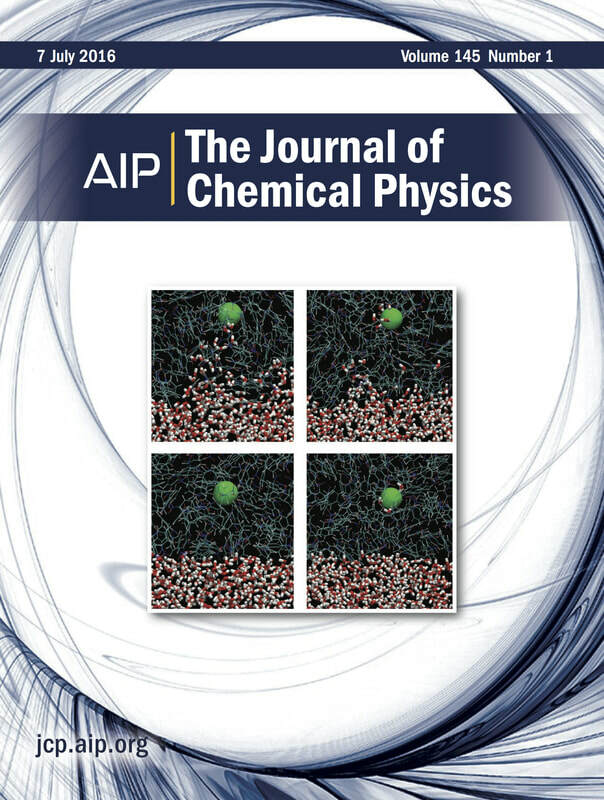 Disabling the electrostatic contribution to the Hamiltonian does not alter local intermolecular structure: Thus geometrical packing effects dominate structure, not electrostatics. Textbook SN2 reactions progress slowly when the reactants are in adjacent, immiscible liquid phases. The cyclic sugar β-cyclodextrin (β-CD) acts as a phase transfer catalyst, enhancing the reaction rate. 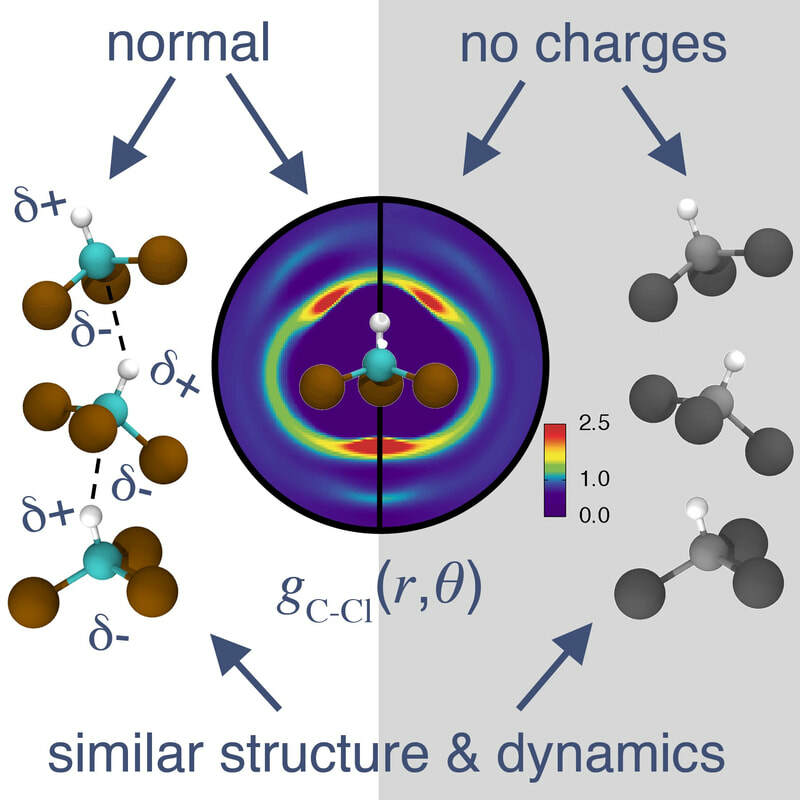 We deconstructed the formation of host-guest complexes and investigated β-CD's energetic impact on a benchmark SN2 reaction using Molecular Dynamics simulations, umbrella sampling techniques, and an empirical valence approach to model reactivity. We considered both geometrical and energetic reaction coordinates to describe the transport of a simple ion between immiscible electrolytes. Computer simulations allow us to impose creative constraints on the system-- constraints that reveal the energetically expensive components of the ion transfer mechanism. ICF uses high-power pulsed lasers to compress hydrogen isotopes and ignite nuclear fusion reactions. My research and design experience in the ICF community focuses primarily on the design, synthesis, and fabrication of fuel capsules or "laser targets" composed of exotic, low-density materials. 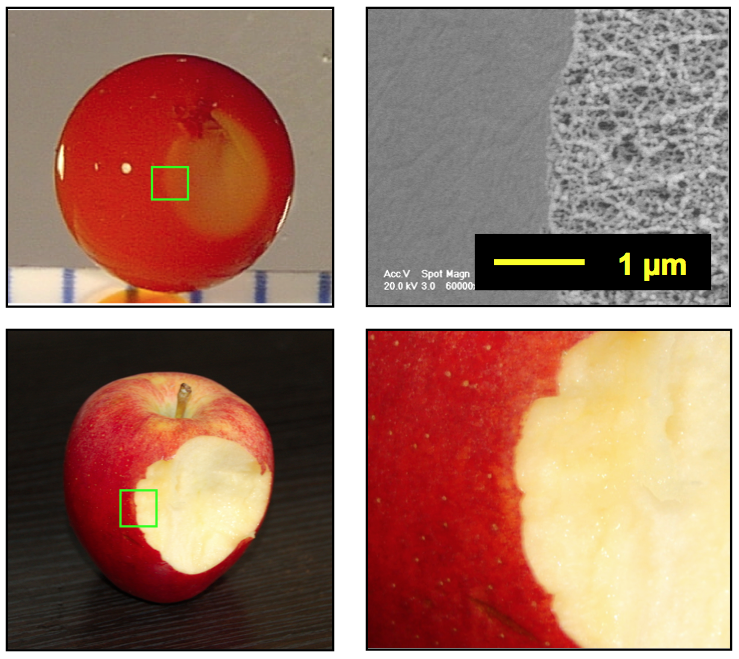 Above: The self-assembled "skin" on this aerogel sphere (top row) resembles the skin of an apple (bottom row): a smooth, full-density coating over fine interior.